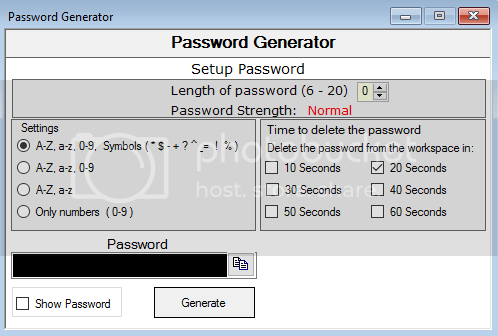 This password generator makes it easy and safe to generate random passwords for strong security.This will generate highly secure passwords that are difficult to crack or guess. In this program you can generate strong password random with length 20 combinations and copy to the clipboard. You can use uppercase letters and lowercase letters, numbers and special characters. You can generate from minimum 6 and maximum 20 combinations length. Show strong password by colors like advanced, high, normal, low. You can choose time to delete password of the clipboard, from 10 to 60 seconds.